Muslim Harji shares his photos of “Robben Island”, where Nelson Mandela spent 18 years of his life, for the first time since he captured them some seven years ago. He decided to release them through this blog following the recent death of the great African freedom fighter and icon at the age of 95. The foyer of the jamatkhana in Tashkurgan, with the Khalifah at the right. Photo: Ghulam Panjwani Collection. Copyright. Watch this page on January 1, 2014. A close-up of a detail of a South African Hundred Rand banknote, featuring an engraving of the face of iconic statesman Nelson Mandela, giving his trademark smile. South African wildlife and African designs form the watermarked background. Photo: Istockphoto. Copyright. My diverse background has provided me with three world-class heroes. As a Gujarati speaking Canadian, Ghandi stands out as my hero. The Mahatma found the roots of his policy of non-violence in South Africa where he experienced racism in its extreme form. There is a saying that India gave South Africa Ghandi and in return South Africa gave India the Mahatma. Heroes Gandhi, Mandela, and Pearson. Image: Wikipedia photos. As a proud Canadian I found my hero in Lester Pearson, Nobel Prize winner for Peace. It is while sitting in a geography class in a segregated school in Pretoria that I was introduced to this figure who originated the Blue Helmeted Peace Keepers to the world. At that time I dreamt of going to Canada. My dream came true!! As a South African born Canadian there is so much one could write about Madiba, My Hero! I shall restrict myself to two things. Nelson Mandela was imprisoned on Robben Island for 18 of the 27 years he served behind bars before the fall of apartheid. Map: Wikipedia. Mandela’s cell at Robben Island. Photo: Wikipedia. His capacity for forgiveness was so deep and pure that it is difficult to imagine. I was fortunate enough to visit Robben Island. The small cell he spent 27 years and the conditions under which he had spent day after day breaking rocks was heart breaking. Tears rolled down my face as I stood in the middle of the quarry. Yet under these awful conditions he stood as a role model for his fellow prisoners, he studied at night, including Afrikaans, the language of his oppressors. How else would he be able to communicate with his prison guards and understand his enemy? How else would be able to negotiate without knowing his enemy. He believed very strongly that forgiveness does not change the past but opens the future. A future for all South Africans and for the world where is civil strife. In one of the interviews he was asked what did you miss the most while in prison. His response was the interaction with children. 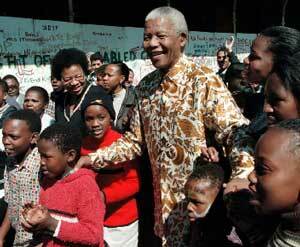 Soon after he became the President of new South Africa he established the Nelson Mandela Children’s Fund (NMCF). Fifty percent of his salary was donated to establish this fund. With headquarters in Johannesburg the NMCF has affiliates in various parts of the world, including Canada. I was fortunate to be the NMCF Chapter Chair for Ottawa. This opportunity to share the ideals and vision of Madiba to the youth of Ottawa through Youth Conferences on the Hill and extra-curricular activities in school was an enriching experience beyond measure. The Brookfield High School Choir sang South African songs throughout the city and at a variety of public events. This was only one of the ways in which Madiba’s vision was shared with Ottawa citizens. As an educator and mediator I have been fortunate to have had these lifetime enriching experiences which I share with my children and especially my grandchildren. They are already following in their grandfather’s footsteps. Date posted: Saturday, December 7, 2013. Please also see Khoja’s piece Ismaili Penmanship in 1906 contributed for Simerg’s special series I Wish I’d Been There. “With the death of Nelson Mandela, the world has lost one of its great moral leaders and statesmen. Mr. Mandela was imprisoned for 27 years by the former Government of South Africa, for his part in the struggle that would ultimately end the system of apartheid. “Despite his long years of captivity, Mr. Mandela left prison with a heart closed to calls for a settling of scores. Instead, he was filled by a longing for truth and reconciliation, and for an understanding between all peoples. “He demonstrated that the only path forward for the nation was to reject the appeal of bitterness. His forbearance was legendary: his magnanimity spared all South Africans incalculable suffering. “Nelson Mandela’s enduring legacy for his country, and the world, is the example he set through his own ‘long walk to freedom.’ With grace and humility, he modelled how peoples can transform their own times and in doing so, their own lives. F.W. de Klerk, left, the last president of apartheid-era South Africa, and Nelson Mandela, his successor, wait to speak in Philadelphia, Pennsylvania, IN 1993. Photo credit: Photographs in the Carol M. Highsmith Archive, Library of Congress, Prints and Photographs Division. US President Barack Obama in a statement issued from the White House said that he was among the countless of individuals who drew inspiration from Nelson Mandela’s life. The first thing that he ever did that involved an issue or a policy or politics, was a protest against apartheid. He mentioned that the day Mandela was released from prison gave him a sense of what human beings can do when they’re guided by their hopes and not by their fears. President Obama concluded his tribute with the following words. “We will not likely see the likes of Nelson Mandela again. So it falls to us as best we can to forward the example that he set: to make decisions guided not by hate, but by love; to never discount the difference that one person can make; to strive for a future that is worthy of his sacrifice. On November 17, 2001 Nelson Mandela and his wife Graça Machel began a three-day visit to Canada by attending a ceremony to rename a Toronto public school after him. He and his wife Graça Machel later receive honorary degrees from Toronto’s Ryerson University. On November 19, 2001 Canada made Nelson Mandela an honorary citizen. In the following years he was joined as Canada’s Honorary citizen by Tenzin Gyatso, the 14th Dalai Lama, Aung San Suu Kyi, the Burmese opposition leader, and His Highness the Aga Khan, 49th Imam of the Shia Ismaili Muslims. Earlier this year, Simerg was granted the privilege of publishing excerpts from Nelson Mandela’s speech that he delivered at Oxford University’s Centre for Islamic Studies. We invite our readers to reflect on the life of a great statesman and to read the speech excerpts by clicking on Renewal and Renaissance – Towards a New World Order by Nelson Mandela. You may submit a tribute or a message of condolence for Nelson Mandela below or by visiting his foundation website, www.nelsonmandela.org.